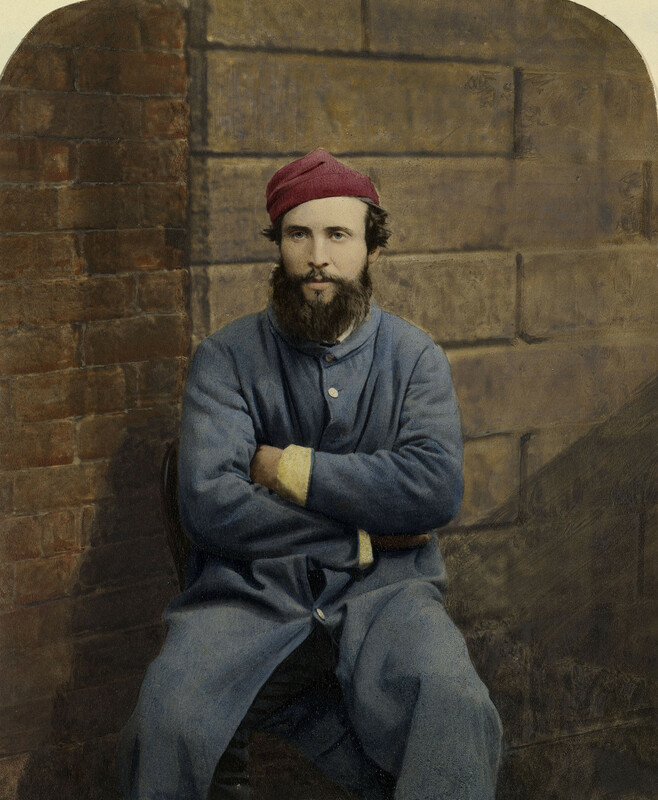 Hand-coloured photograph of Private John Dryden seated with his arms crossed. He is wearing blue hospital clothing and a red hat. There is a brick wall behind him. John Dryden served with the 11th Prince Albert's Own Hussars during the Crimean War. He was wounded during the Charge of the Light Brigade, suffering 27 lance wounds to his back and sides and cuts to his head and the bridge of his nose. He was taken prisoner on 25 October 1854 and was eventually exchanged at Odessa a year later, on 26 October 1855. He was invalided back to England [on 23 January 1856]. He was one of the wounded veterans seen by Queen Victoria at Chatham Military Hospital. Following her visits to the hospital she commissioned a series of photographs of the veterans from the photographers Joseph Cundall and Robert Howlett.